This all-ages exhibition explores the science behind recent fossil finds in China, providing an insight into the complex nature of the evolution of dinosaurs. The exhibition unveils the history behind the horns, spikes, quills and feathers of the dinosaurs to explore the evolutionary link between one group of dinosaurs and modern birds. TMAG Director Janet Carding said that Dinosaur rEvolution: Secrets of Survival is an exciting new way of thinking about dinosaurs and is sure to captivate audiences. “We are delighted to have the opportunity to offer this experience at TMAG and we anticipate it will be a huge drawcard over the summer”, she said. Dinosaur rEvolution: Secrets of Survival is presented by TMAG in partnership with The Royal Society of Tasmania (TRST). Professor Ross Large, President of TRST and Distinguished Professor of Economic Geology, University of Tasmania, said that the exhibition is the centre piece of the 175th Anniversary celebrations of the Royal Society. “Our mission is ‘The Advancement of Knowledge’, and this exhibition is at the cutting edge in the scientific knowledge of dinosaur evolution. T-Rex with feathers is enough to blow anyone’s mind!" he said. 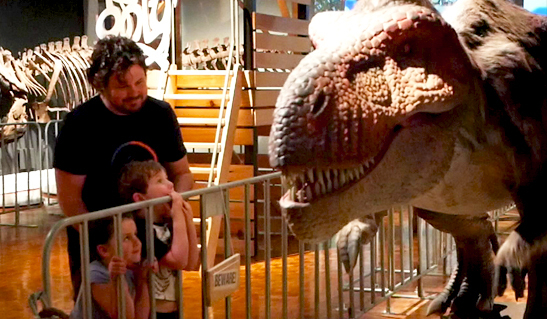 In addition to the Royal Society, TMAG has worked with a range of other partners throughout Tasmania to bring Dinosaur rEvolution: Secrets of Survival to the museum, including major partner, Tasmanian bakery, Cripps Nubake. We would also like to acknowledge the support of our exhibition partner, Gondwana studios, our education partner, the University of Tasmania, technology partner, Handbuilt Creative, supporting partner, the Friends of TMAG, production partner, Think Big Printing and our media partners, the Mercury and Southern Cross Austereo. Additional support has been provided by The Old Woolstore Apartment Hotel, RACV/RACT Apartment Hotel Hobart Events Tasmania and Inspiring Australia. Accompanying the exhibition is an extensive public program of events, talks and learning programs, beginning in December and continuing throughout the summer onto 2019. Kicking off TMAG’s dinosaur season as part of the opening weekend of celebrations, is a special dinosaur-themed Discovery Day on Sunday, 9 December. Dinosaur rEvolution: Secrets of Survival runs from 7 December 2018 to 5 May 2019 at TMAG. For more information and to book tickets, please visit the website. Click here for further information on the public program activities. This page was last modified on 7th December 2018.